The Altitude of a celestial body is its angular distance above the Horizon. The Altitude of a celestial body may be measured with a sextant to give the measured Altitude. The Altitude as calculated from the Estimated Position using Sight Reduction Tables, or some other means of calculating what the Altitude should be from your Estimated Position, is called the calculated Altitude. By comparing the measured Altitude to the calculated Altitude for your Estimated Position, a Position Line may be drawn on your map or chart. If sight of the natural Horizon is not available, an Artificial Horizon is some means by which an observer can refer to a horizontal plane through his position. With a marine sextant, it is common to use a mirror in the horizontal plane. The angle between the celestial body as seen in the sky and as reflected in the mirror is measured with the sextant. Halving this angle gives the Altitude of the celestial body above the Horizon. 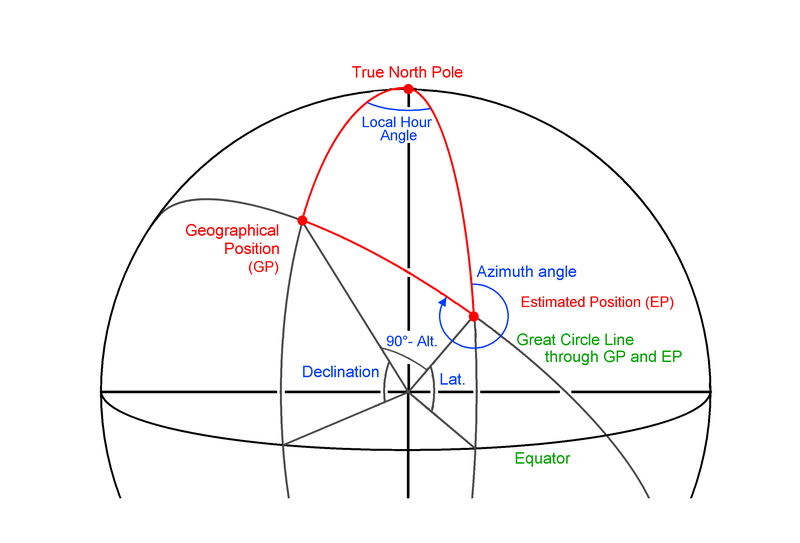 The Azimuth of a celestial body is the bearing of the body from your position, as measured clockwise from true North. So for example, at mid-day (strictly, at local apparent noon), the sun will be in the South and have an Azimuth of 180°. The celestial body will be in one of four Azimuth Quadrants. If it is to the NORTH WEST, (Azimuth 0° to 90°), then it is in the NORTH WEST quadrant and so on for the SOUTH WEST, SOUTH EAST and NORTH EAST. The Declination of a celestial body is the latitude of its Geographical Position North or South of the Equator. A plane through the centre of the earth intersects the surface of the earth on a Great Circle. So the centres of Great Circles are always at the centre of the earth. The Greenwich Hour Angle (GHA) is the angular distance to the Meridian of the celestial body, as measured Westwards from the Greenwich Meridian (0° Longitude, also called the Prime Meridian). The Geographical Position of a celestial body it that point on the earth's surface where the body is directly overhead, or at its zenith. This position is usually expressed in terms of the Greenwich Hour Angle (GHA) and the Declination (Dec.) of the celestial body. The sensible Horizon is a horizontal plane through the observer's position. Here, "horizontal" means normal to a plumbline at the observers position. The visible Horizon, as seen from a ship at sea, is actually at an angle slightly below the sensible Horizon due to the curvature of the earth. Almanacs will give "Dip Tables" to account for the difference in angle between the visible and sensible Horizons. If the index mirror in a sextant is not set at the correct angle, there will be a systematic error in the measured Altitude called the Index Error. With a marine sextant, it is a simple matter to determine the Index Error each time the sextant is used by viewing a celestial body through the horizon mirror and the via the index mirror at the same time. The two images should coincide when the index arm indicates a reading of 0° on the arc. Any difference from exactly zero degrees is the Index Error. The measured Altitude can then be corrected for the Index Error. With a bubble sextant, the Index error needs to be determined by a set of sights on a celestial body such as Polaris (which moves very little in the sky) from a known position. The difference between the measured Altitude and the calculated Altitude is then due to Index Error. Obviously, it is not possible to determine the Index Error for a bubble sextant very frequently. The Local Hour Angle (LHA) is the angular distance to the Meridian of the celestial body's Geographical Position, as measured Westwards from the observer's local Meridian. A Meridian is a Great Circle line which passes through the poles of the earth. A local Meridian is one that passes through the observer's local position. The Greenwich Meridian passes through Greenwich, England, and is defined as having 0° Longitude. The "Nautical Almanac" is published by Her Majesty's Stationary Office in the United Kingdom and by the US Government Printing Office in the United States. It gives the positions for the Sun, the Moon, the visible planets and 58 selected stars for each day of one year, from which the Geographical Position of those celestial bodies may be obtained. It also has a concise set of Sight Reduction Tables. The so called "Navigational Triangle" is a spherical triangle formed on the earth's surface by the North Pole (true North), the observer's Estimated Position and the Geographical Position of the celestial body. These points are connected by Great Circles, two of which are Meridians. One Meridian is the Longitude for the Estimated Position and the other is the Greenwhich Hour Angle of the Geographical Position. There are six angles associated with any spherical triangle. In the Navigational triangle, three of these angles are known, leaving three unknown angles. We need to find two of them to determine the Azimuth and the calculated Altitude. The calculated Altitude is derived from the angle 90°- Alt. which is shown in the drawing. When this angle is zero for example, the celestial body will be directly overhead and the Altitude of the celestial body will be 90° above the horizon. Similarly, the Azimuth angle shown is the obverse of the included angle in the triangle which is actually calculated. It is shown this way because the Azimuth is defined as the bearing of the Geographical Position as measured clockwise from true North. 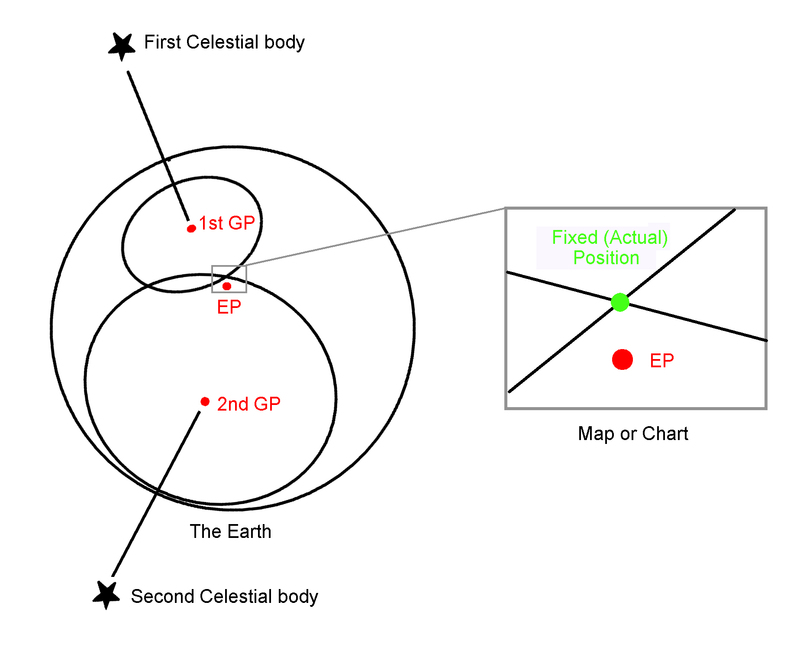 If the GP and the EP were swapped over in this diagram, the Azimuth would then be the included angle in the triangle. The Azimuth derived using these formulae will always be an angle less than 90°, so a correction will need to made depending on the Azimuth Quadrant in which the observed celestial body is located. If the observed body is in the WEST and SOUTH, add 180° to obtain the correct Azimuth. If the observed body is in the WEST and NORTH, subtract the derived Azimuth from 360° to obtain the correct Azimuth. If the observed body is in the EAST and SOUTH, subtract the derived Azimuth from 180° to obtain the correct Azimuth. 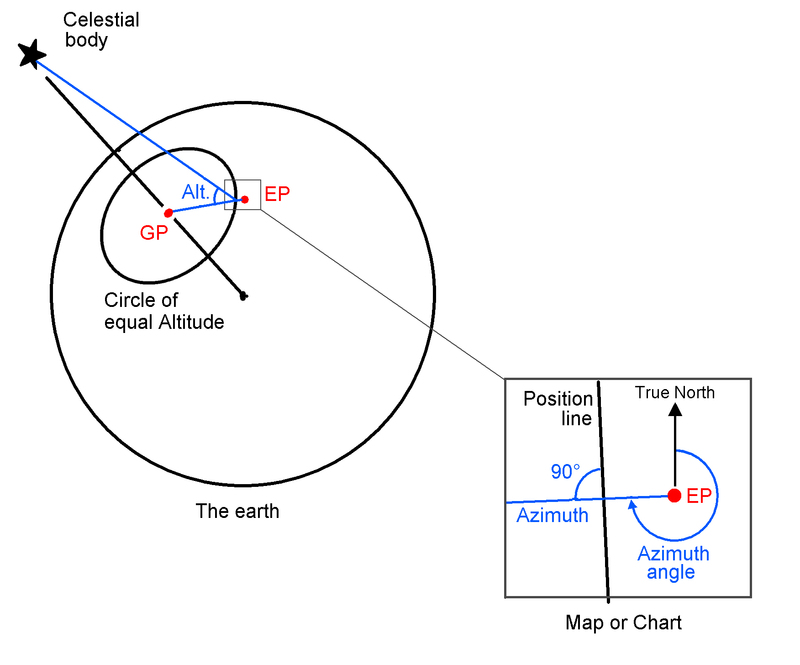 If the observed body is in the EAST and NORTH, the derived Azimuth is correct. The Estimated Position is the latitude and longitude at which the observer estimates his position to be, before fixing his actual position with the use of a sextant. The Fixed Position is the latitude and longitude at which two or more Position Lines intersect on the map or chart. When you measure the Altitude of a celestial body with a sextant, you know you are somewhere on a circle of equal Altitude which can be drawn upon the earth's surface, centred on the Geographical Position (GP). On the much smaller scale of a map or chart, the circle of equal Altitude approximates to a straight line running through it. This line is called the Position Line. Usually you can be reasonably sure that you are somewhere near your Estimated Position (EP), so you will be somewhere on the Position Line as drawn on the map or chart. Using the Geographical Position and the Estimated Position, Sight Reduction Tables will give you a calculated Altitude from the Estimated Position, and an angle for the Azimuth from the Estimated Position to the Geographical Position. To construct a Position Line on your map or chart, an Azimuth line is drawn radially from the Estimated Position. The Position Line is drawn at 90° to the Azimuth. It is drawn at a distance from the Estimated Position equal to the difference between the calculated and measured Altitudes. If the measured Altitude angle is greater than the calculated Altitude, your actual position is closer to the Geographical position than the Estimated Position and the Position Line is drawn towards the Geographical Position. If the measured Altitude is less than the calculated Altitude, your actual position is further away from the Geographical Position than your Estimated Position. A contra-Azimuth line is drawn from the Estimated Position at an angle equal to the Azimuth + 180°. The Position Line is then drawn at 90° to this line. Having passed through the vacuum of outer space, the light from the celestial body has to pass through the atmosphere before it is observed using a sextant. The atmosphere tends to bend the path of the light as it passes through, so that the celestial body appears higher in the sky than it would be if there was no atmosphere. A calculated Altitude assumes the earth has no atmosphere, so the sextant Altitude has to be corrected for Refraction so that it can be compared to the calculated Altitude. Refraction tables are always included in Almanacs used for celestial navigation. Sight Reduction Tables are sets of tables from which the calculated Altitude and Azimuth of a celestial body may be obtained from an Estimated Position. They range from a set of volumes that would fill a long shelf, to slim volumes of "concise" sight reduction tables. In general, the larger the volume(s) of tables, the quicker they are to use. The Nautical Almanac has a set of concise sight reduction tables in the back, as does the "Long Term Almanac 2000 - 2050" by Geoffrey Kolbe.